Impetigo, or school sores, is a bacterial skin infection caused by staphylococcus aureus or streptococcus. It is common in toddlers and school aged children during the summer months. This is a bacteria that lives on the skin, in nasal hairs, underarms and in groins. If the skin is traumatised, due to scratching, insect bites, scrapes and cuts, it may infect resulting in the characterstic school sore appearance. This sore will be heavily infected and scratching will transfer this infection to other parts of the body. Sometimes a similar bacteria called streptococcus pyogenes is the culprit, though the treatment is the same. The sores may start off with a blister, called bullous impetigo, or they may spread from an existing skin problem such as an insect bite. Treating the infection requires eradicating the bacteria from the sores using antibiotics. If there are numerous sores then oral antibiotics and an antibacterial ointment called bactroban® needs to be prescribed. If there are only one or two spots then the ointment is enough. In both cases it is important to treat areas such as under the fingernails and nasal passages with the bactroban a few times per day. Cover with a non adherent dressing if possible over the top of the sore. Note that topical disinfectants do not treat impetigo. 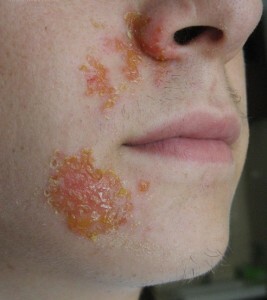 To ‘catch’ impetigo there needs to be direct contact with the infected sores. The child with impetigo will also commonly have the bacteria under the finger nails and on clothing. It is not transmitted in saliva or coughing or in bowel actions. Once treated for 24 hours, and as long as obvious sores are covered a child can return to daycare or school. If treated properly complications are rare. A rare complication following infection with the bacteria streptococcus is a kidney disease called glomerulonephritis. This is rare in urban Australia but is seen commonly in indigenous populations. What about recurrent infections ? In some instances, people will have multiple recurrent staphylococcus infections. This is usually due to long term carriage of the organism in places that the antibiotics cannot reach. This includes the nasal passage, the fingernails and under the arms. Treating these areas is important, and sometimes it is necessary to treat the whole family. This can be particularly difficult problem, especially if the child has eczema. For the nose apply bactroban 3 times per day for 5 days, then 2-3 times per month place some antibiotic ointment across the entrance of the nasal passage using a cotton bud. Wash or bath using an antibacterial called triclosan, some examples include phisohex®, oilatum plus®, or QV flare up®. It is a good idea to also wash the hair with the triclosa, and leave for three minutes. Place combs brushes hair ties in the dishwasher, or get new ones and do not share these. Remove all piercings whilst performing the above – for at least 5 days. There is little evidence that recurrent infections are due to a weakness in the immune system or some lack in vitamins or minerals.